Big Fish Audio/Funk Soul Productions went through tons of vintage R&B tracks from the 60s and 70s, and chose hundreds of the greatest grooves ever laid down. They then captured the sound and vibe of those iconic beats, using vintage drum kits that were carefully tuned and processed to emulate the sound of the original tracks. 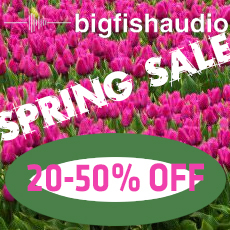 Lastly, Big Fish Audio/Funk Soul Productions recorded the congas, bongos, hand percussion, claps, and finger snaps parts from those same classic beats, and created separate loops for all of those parts. For each beat you get a pre-mixed drums only loop, pre-mixed drums and percussion loop (if applicable) as well as all the individual mic positions (Kick, Snare, OH, Room) and individual percussion elements. Great grooves partnered with the flexibility of our KLI and Multi-formats means a must have collection of beats!